Every year, Jesse and I host a big Holiday party for "grown-ups" (B has a sleepover at Grandma's). It's a fun tradition, and a great opportunity to stay up late and drink a little too much wine! We usually have everyone pile their coats and bags in our bedroom, but this year I wanted to welcome our guests with something a little more organized. Our front entry got a makeover a few months ago, with a mid century cedar storage bench, coat hooks and a wall mounted box for keys and mail. The set-up provides plenty of space for our family, but with about forty RSVPs for yes, we were going to need a few more hooks! There are two huge storage closets in the hallway. 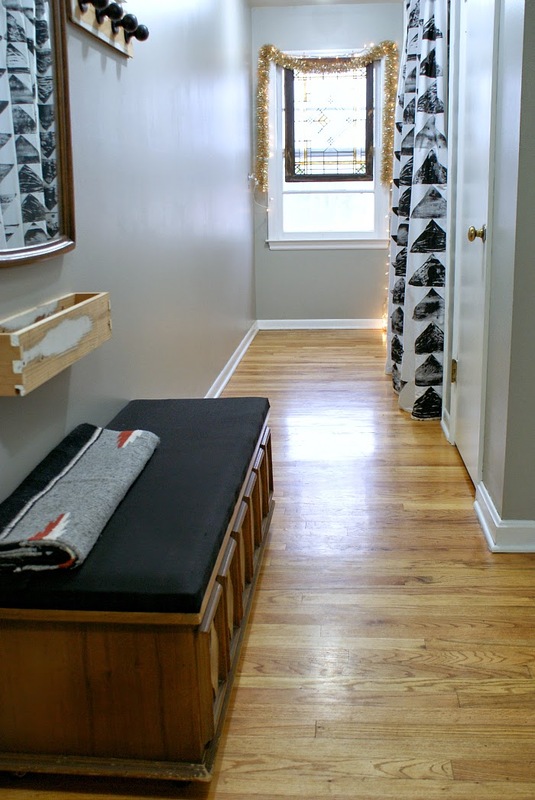 plus a smaller coat closet. We removed the doors from the large closets (you know I like to remove closet doors! 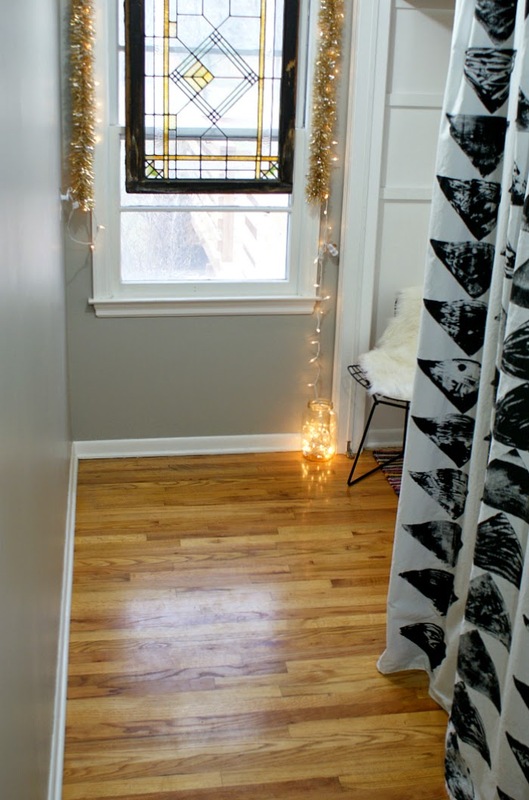 ), hung stamped curtains in front of one and left the other closet open. We were storing our bikes and B's stroller in open closet, but winters are long around here and the closet needed to be painted anyways so we re-located everything to the basement. We might bring the bikes back up in the summer, depending on how often we are using them. After cleaning out the closet, I patched a few holes and then painted it white. I needed about twenty coat hooks and the most basic option at the hardware store cost about two fifty. I was able to save on cost by using salvaged hooks from Habitat ReStore, along with a couple new and previously owned. I spray painted all the hooks black for cohesion and Jesse helped me space and mount them. I love the quirky look of the mis-matched coat hooks, plus I saved about twenty bucks! 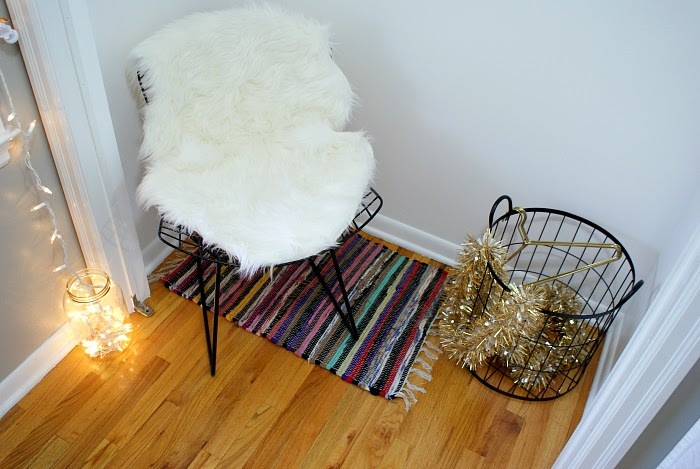 Once the hooks were mounted, I added our Bertoia chair along with some inexpensive accessories. The gold wreath was an estate sale find and the brass coat hangers are vintage as well. My dad has some antique brass coat check tags which would have been super fun to hang on the hooks, but he wouldn't hand 'em over...I'm going to keep bugging him about it! Our house is relatively small, but I feel very lucky to have these extra closets for flexible storage space! Where do you ask guests to put their things when you host? I grew up putting them on a designated bed, is that just a Midwest thing? Did you make your wreath? I'd love to make one.